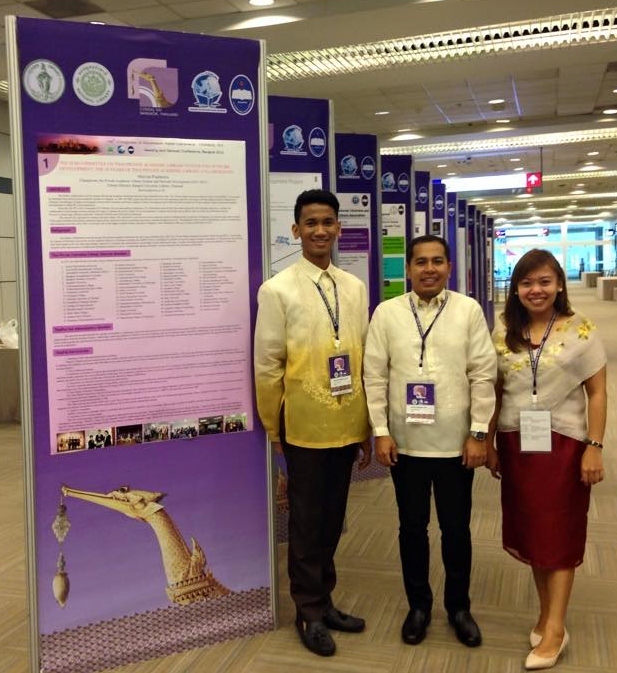 The 16th Congress of Southeast Asian Librarians (CONSAL) attracted about 800 delegates from 20 countries. CONSAL is a regional organization which provides a venue for librarians of Southeast Asian nations to have a dialog and promote cooperation in related fields of librarianship. Its mission is to lead the region towards greater participation in the international information community. The conference which happened last June 10-13, 2015 was sponsored by the Thai Library Association and the National Library of Thailand. A total of 84 papers were accepted including the paper of Mr. Joseph Yap, IMS Coordinator co-authored with Mr. Bilyson Alejo, Librarian from Citco, entitled, “The Voice of the Young: Attitudes and Perceptions of LIS Students and Young Professionals towards Professional Library Associations” was delivered. Another paper by Mr. Joseph Yap and Ms. Donna Lyn Labangon, Special Collections Librarian, entitled, “Embedding Corporate Social Responsibility (CSR) Activities in an Academic Library: Highlights on the Social Aspects of the Human Library” was also presented. The theme for this triennial event is “ASEAN Aspirations: Libraries for Sustainable Advancement.” There were eight subthemes distributed under six parallel sessions: 1. Information technology to enhance ASEAN knowledge; 2. ASEAN libraries cooperation; 3. Corporate social responsibility; 4. Library education and training; 5. Role of library consolidation towards library development; 6. Library in ASEAN reading society; 7. Conservation and preservation; and 8. Ethics and standards.